Thread: Golden Bean 2018 - Overall winner - CoffeeSnobs. 1500 odd entries and the total scores from our Espresso, Latte and Filter were high enough to nail the big one. Stunned, shocked, excited and very, very proud to have a room full of peers judge our humble offerings as the best in the country for the second time (surely the second time can't be a fluke!). All the above beans are what we entered and are available in BeanBay as roasted or green or both. Really need to have a shower now and wash off the face paint and wax from the fancy dress presentation party and get at least a little sleep before the sun comes up and I head home. It was a surreal punchline to a great night out, I truly didn't expect that our simple offerings roasted with lots of love could stand-up against "fat pockets" and some seriously exotic beans. Thanks to the judges that loved what we do as much as we love what we do! artman, coffeechris, Ronin and 33 others like this. Unreal! Congrats, Andy! I’m getting more Ardi - That’s one of my favourite coffees ever. Fantastic news Andy! And well deserved! Wow Andy fantastic achievment - again! Congratulations !!! That's amazing. Well done Andy, you and the crew must be stoked! Congratulations Andy, amazing result - especially as you say against deep pockets with beans they don't use commercially. Andy and trickydicky2 like this. Well deserved reward and recognition for all the hard work and commitment to the craft. Congrats! Congratulations Andy, that is a wonderful achievement! Seeing within these forums the passion and pride you have for all things coffee, it only makes logical sense that this translates through your roasting. Well done Andy and the team. The passion you have and your desire to help and promote roasting is second to none. Huge congratulations Andy, your passion and dedication has inspired so many of us to keep seeking improvement in our roasting and coffee journeys. Big Congrats to Andy and the CS team, great result that reflects the love you have for coffee and the coffee community! It's great to see people winning with beans that are available to anyone who wants to have a go! Andy, Pretzal, trickydicky2 and 1 others like this. I've loved your coffee's for many years now. It's great that you're getting the affirmation you deserve. It's always good seeing the small guy taking on the big guys and winning! In which categories were each of the listed beans entered please? When a craft comes from passion rather than duty, the results are so often very special. Congrats Andy. We all knew that it was never a fluke. You deserve it. Seriously congratulations Andy, so well deserved, what an amazing result, bask away in this achievement! Thank you for inspiring such an incredible amount of people with this amazing passion, I would never have gotten this far in my love for coffee without you and this wonderful community. Getting 1st is such a testament to your love for the craft, well done! Thanks for the well wishes everyone, I love being able to share it with our community here. Obviously I'm still buzzing and having a little trouble concentrating on what I "should" be doing after a week away from work but I'm still getting a cheeky grin each time I walk past the trophy. I entered 10 coffees and we scored a bronze or silver medal for all of them which was very cool. The overall winner of the Golden Bean is the roaster that scores the highest for Filter, Milk and Espresso (one coffee from each). All available to try in BeanBay. Dimal, Javaphile, simonsk8r and 4 others like this. Maybe a Special Celebratory Sampler pack of the Medal Winning roasted beans? Wish I could do half as well mate. Andy and sprezzatura like this. Roasted beans available in 500g lots, green beans in 2.5kg -- so you can make your own special celebratory pack! 4 x 250g? Just a thought. Limited run. If you got it, flaunt it! P.S. 1/2 Sampler (sort of) ordered, 2.5kg Green of each Costa Rica Miel SHB & Ethiopia Ardi Naturals. I'll see what sort of damage I can do to them. P.P.S. Ordered around 4:35pm, in Australia Posts hands at 5:48pm. Wow. That's bonkers service! Last edited by CafeLotta; 26th November 2018 at 09:18 PM. I am in for some Ardi green and roasted, time to try some new methods and learn from the best! Andy and Janus like this. Careful mate. People might start to think you know what you’re doing!!! Andy, simonsk8r and level3ninja like this. Tip - Give the Ardi plenty of rest. From my own testing I decided that it really "popped" at 2 weeks so my competition entry was 2 weeks before the judges would get it but I have some from the same batch in the Brazen today and it's still as good at 3 weeks old. Dimal, Steve82 and ecrangle like this. Love the addition to the logo at the top of the page! Well deserved Andy, enjoy it! Andy, Dimal, CafeLotta and 1 others like this. A real David and Goliath story. Love it! Thanks heaps everyone, it's great to share the excitement with the community. As you can guess it's been an insane few days. I'm back on the tools now, roasting up a storm so those waiting to try the Ethiopian Ardi will be getting it really soon. matth3wh and solace like this. Jeeze, I disappear for a couple of days and look what happens!!! Way to go Andy! WooHoo!!! Are the Ardi and Costa beans OK for beginners to use green? (yes I got a roaster...) I've already got the Columbia and India Elephant Hills so far. mouse over it.... it tells ya! Are the Ardi and Costa beans OK for beginners to use green? Of course they are. I was a home roaster once too! Andy, Dimal, Javaphile and 3 others like this. I was lucky enough and Andy generous enough to pry last 500g Ardi Naturals Golden Bean entry from family use. Brewed in V60 1g / 16.6g water as close to 92C as possible. 21g in 22g VST filter at 92C 42g out around 30sec. Sets the bar very high! Amazing development given the roast depth. The fruits absolutely sparkle with no overwhelming natural funk. Plenty of depth with a long finish, absolute cracker well done. Except for a couple of shots worth the rest is now frozen in time! It is reinvigorating to have such a great reference point into the future for my own roasting. You were really lucky to end-up with some from the actual comp roast but I'm fairly confident that most of my future roasts will be the same. The roast I did on Wednesday was bang-on the profile and I expect it will develop into just as good a coffee. Nah, not a reference point, a target to beat! You have the same amazing green beans there, outdo me. I am looking forward to ordering some green and roasted beans of the winning entries, and hopefully learn a few thing or two. Just curious, of the winning entries (in particular the single origins) , did you use the same roast profile for filter, milk and espresso? or did you adjust slightly for each category? 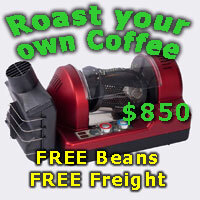 We make the comp coffees available in green or brown (unlike many other comp entries that appear to only ever exist as comp entries) but we never talk about our specific techniques and profiles for competition roasting as it's already too damn hard to get your coffee to standout in a crowd of 1500 entries. I need to keep a few learned aces up my sleeve. Dimal, Javaphile, Lukemc and 2 others like this. The only reason I ask is I remember you said properly roasted beans will taste great in any brew method, and since there are no options to choose which style (filter, espresso, or latte) in beanbay, I had assumed you might have entered same roasts for all 3 categories. Which style of extraction method would you recommend for roasted beans from Beanbay? I just want to make sure I get the best out of the coffee I ordered, and to get an idea what to aim for my own roasts. Yes, I understood the question just like you understand my answer. Your favourite method of coffee making will be great. ...let me know if it isn't. Dimal, fatboy_1999, saeco_user and 1 others like this. Haha. Alright Andy, I got you. Will be placing an order today, some very interesting beans available at the moment. now there's a flash from the past. Received my order on Monday, and what I can say.. Andy's Ethiopia Ardi Naturals is just WOW! Up on opening the bag i got hit with this bomb of blueberry muffins, the strongest impression I have gotten yet from opening a bag. I am still a newbie in training, so a lot of times I never quite get it when other forum members mentions more subtle fruity flavours like blueberry, peach etc.. but not this time! Using 15gs , Niche zero grinder, I got 25g out from 45seconds (incl. 10s preinfusion) out of Electra MCal. As an espresso, the blueberry muffin flavours still remains, smooth as! Adding milk , is just a smooth, silky.. and perhaps now blueberry mlikshake?!! Will be interested in how it goes as a filter/pour over tomorrow morning. Amazing example of a roast done right, one of the more memorable coffees I have had recently! Well deserved medal winning entry, and i highly recommend it to other CS members if they haven't ordered one ! Thanks justacuppa, we love hearing that are taking people on a sensory discovery tour. Motivates us to keep doing what we do! That Ardi is less than a week old, they get even better at 2 weeks (if you can manage to hide it from yourself once it hits the filter). Now all you have to do is better my roast with the green beans you have there, no pressure of course. Justacuppa you sold me! I'm in, I love a berry bomb coffee, have ordered some!! Thanks heaps to David Cairns for the story and Stephen Harman for the picture (even though he made me put my hands in the beans). Awesome to get a full page, hopefully lots of people buy Monday's paper! Dimal, flynnaus, herbie and 7 others like this. Cool stuff Andy, great write up! Andy, Dimal and matth3wh like this.